Found on the Mobile Web is a weekly WAP Review feature listing newly added and updated sites on the YesWAP.com mobile portal and WapReview mobile site directory. With these latest additions the directory and portal now list 2366 mobile sites. Tampere 1918 zones.zonear.com/tampere1918 Interactive mobile guide to the new “Tampere 1918” exhibit at Museum Centre Vapriikki in Tampere, Finland . The exhibition covers the tragic Finnish Civil War of 1918 in which 40,000 people were killed in four months fighting between the Red and the White Guards. 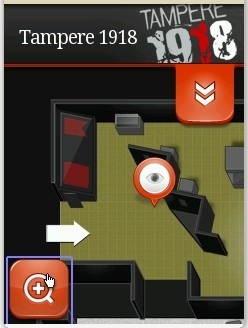 The HTML5 mobile guide includes an interactive floor plan of the exhibition space with audio narrative and historical photos. It was developed by a Finnish startup Zonear Ltd and can be used with any touch screen mobile device with a modern browser. Techcraver techcraver.com Techcraver.com is Jason Harris’ blog covering mobile hardware, applications, platforms, software, web services, consumer electronics and other technology and how they affect people and society. Jason is a solutions architect, developer and freelance writer whose content has been published by GigaOm, Web Worker Daily, CMSWire and WOMWorld/Nokia. Web AddiCT(s); www.webaddict.co.za Rafiq Philips and Miguel Dos Santos cover web technology, social media, business strategies, fair use, open source and the South African tech scene. The blog’s name is an acronym for Web “2.0″, Applications, Developments, Designs & Innovation in Cape Town. Source: 30 Great African Tech Blogs. Me Card www.servletsuite.com/meshare/ MECARD is new format for sharing contact information. A MECARD is a single line of text containing all of the meta data needed to populate an address book entry; name, address, telephone number, email address and URL. 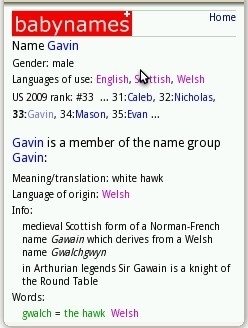 Enter a name to view its meaning, language of origin, languages of use, rank in the top 500 names and name variants. All World Dance www.dnce.mobi Published by dance scholar, dance fan, former dancer and choreographer Clyde Smith, All World Dance provides daily news about the world of dance across genres from ballet to breakdancing. xTweets xtweets.mobi xTweets is a Twitter mobile directory for mobile webmasters that was built with XtGem. It fetches your latest tweets and displays them, with a link to your mobile site, in a timeline with tweets from other xTweets users. The service is free, all you need is a Twitter account. 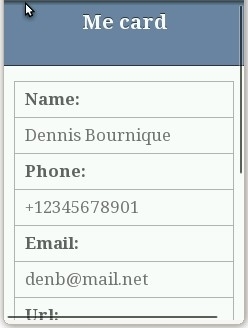 Tweet In insyt.mobi/tweet/ Full featured twitter web client optimised for mobile and touch devices by inSyt.mobi. Tweet, reply, retweet, share, follow, follow back, unfollow, direct message, favorite, lists, twitpic, search, trends and more. 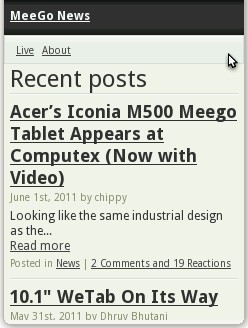 MeeGo News meegonews.com Dhruv Bhutani‘s MeeGo News is my favorite independent source for the latest news about the MeeGo OS. 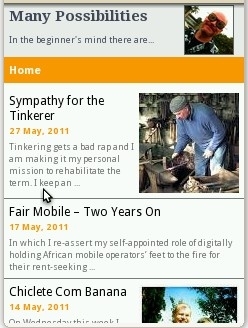 The site’s writers include Steve ‘Chippy’ Paine from CarryPad.com and Christopher McFann from Symbian-Freak. This entry was posted in Found on the Mobile Web and tagged Baby Name, Dance, HTML5, MeeGos, Tampere, Tech News, Twitter by Dennis Bournique. Bookmark the permalink.